Weybread Woodcraft recognises the importance of environmental considerations, we only use FSC certified products. Our timber suppliers operate a preferred supplier policy which gives preference to timber certified as coming from well managed forests by one of the recognised third bodies such as FSC certified products. FSC products have their forest of origin independently inspected and evaluated according to the FSC criteria. Accoya is the world's leading high technology long life wood. Created via acetylated wood modification, using sustainably grown timber, the Accoya process is non-toxic. It enables nature and creates a modified wood that matches or exceeds the durability, stability and beauty of the best tropical hardwoods. The Accoya wood production process takes sustainably-sourced, fast growing softwood and in a non toxic process that 'enables nature', creates a new durable, stable and beautiful product, a 'treated timber' that has the very best environmental credentials. A new world of high performance wood, sustainable, low maintenance products - including windows, doors, decking, cladding and glulam structural beams - is opened up by Accoya wood. The exceptional properties of durability, stability, strength and beauty have even led to Accoya wood being used as the main construction material in a heavy traffic road bridge with highly original design. Accoya is helping to protect the worlds precious hardwood resources and is guaranteed for 50 years in exterior use and 25 years when used in the ground. Yhis long life also provides an added benefit - helping to reduce carbon emissions. Accoya is ideal for windows, doors, cladding, decking, structural and much more. For window frames, Accoya wood is the material of choice. Not only does it have extremely low thermal conductivity but it matches or exceeds the durability and dimensionally stability of the best hardwoods. It can be opaque coated, or for those wishing to enjoy the natural look of wood, translucent coated. Accoya's low maintenance requirements add to its cost effectiveness and environmental credentials. Exterior doors and shutters should be durable, dimensionally stable(to prevent doors jamming and becoming difficult to open and close in bad weather) and easy to maintain. Accoya wood meets these criteria and may be used to create simple or complex designs with a choice of coating finishes with typically greatly improved lifetimes. Accoya wood is a perfect solution for exterior cladding, siding and facades where aesthetics, less frequent maintenance, durability and insulation value are key factors. Accoya's versatility makes it ideal for use in residential, commercial and industrial structures. In specifying decking, beauty, strength and all weather performance are important. A material that is durable, stable and beautiful is desirable. It is also crucial that the wood is non-toxic and therefore totally safe for people and pets. Accoya wood meets these requirements. Accoya wood has been modified right through to the core and this non-toxic process doea not weaken the origianal wood - in fact, its hardness is improved - nor does it compromise its bending strength. Therefore combined with exceptional durability and stability Accoya wood can be an ideal material for structural requirements and has been used in bridges and other large structures around the world. ~ Wood is a non-toxic, recyclable raw material. ~ Wood is light yet strong and easily worked. ~ Wood offers good sound absorbtion. ~ Wood can be used as a bio fuel at the end of its product life. ~ Wood is our only truly sustainable resource for construction. ~ Wood is a natural insulator and, as such, reduces energy used for heating. ~ Wood reduces the effect of global warming as trees and wood products act as carbon sinks. ~ Wood is sustainable and healthy: every cubic meter used saves tonnes of CO2. By using sustainably grown wood and improving its properties without adding toxins, Accoya helps protect threatened species, rainforests and the environment. Extensive laboratory and field testing by leading institutes around the world (including New Zealand, USA, UK, Sweden, Malaysia, Indonesia, Russia, the Netherlands and Japan) has shown the performance of acetylated wood is extremely reliable. Accoya wood has been thoroughly tested for dimensional stability, durability, UV resistance, paint retention and in-ground conditions to ensure optimal performance. Indeed, it is so reliable that for many years it has been, and continues to be, used by scientists as the bench mark against which other treatments and modifications are measured. ~ Lasting 50 years above ground, 25 years in ground/freshwater. ~ Class 1 durability, surpassing even Teak. ~ Swelling and shrinkage reduced bt 75% or more. ~ Doors and windows open effortlessly year round. ~ Paints and varnishes last 3 or 4 times longer, greatly reducing maintenance costs. ~ Indigestible to a wide range of insects, including termites. ~ From FSC, PEFC, and other regionally certified woods. ~ Consistent, measurable modification quality from surface to core. ~ No need to apply chemical preservatives when cut or planed. ~ The process does not compromise the woods strength. ~ High strength to weight ratio makes it suitable for challenging applications. ~ Improved stability means coatings last 3 to 4 times longer. ~ Easier to coat, less preperation and sanding required. ~ Superior resistance to UV degradation when translucent coated. ~ Natural appearance lasts longer. ~ The ultimate substrate and coating life is increased. ~ Offers improved insulation in comparison with commonly used wood species. ~ Ideal for applications where energy conservation is important. ~ Process does not compromise the woods natural beauty. ~ Protects the environment from the harmful effects of common treatments. ~ May be safely reused and recycled. Colour - light tan to biscuit with silver grey figure on quater-sawn. Usually straight grained but varies with growing conditions. This is an increasingly popular timber with interior designers and shop fitters. Moderately durable. Strongly resembles plain sawn oak, having a yellowish brown sapwood and darker brown heartwood, but no obvious modularly rays. It is straight grained and fairly coarse in texture. It's easy to work and gives an excellent finish. Heartwood is dull to reddish brown with yellowish white clearly defined sapwood. Coarse textured with a wild to straight grain, given careful drying and machining an excellent finish can be obtained. Colour - white to creamy white with a silky lustre, which tends to darken to a pale golden brown. There is no distinction between the heartwood and the sapwood. It has a straight grain with a fine uniform texture and is hard, but not durable. It works easily to give an excellent smooth finish. The sapwood is creamy white and is sharply defined from the golden, warm-brown of the heartwood. Radial sawn material shows the characteristics silver grain figure. The timber is hard, heavy and durable. Coarse in texture and straight grained, requiring careful seasoning, it can be worked to a fine finish. Indigenous to the British Isles, it is probably the best known and one of the most useful of all timbers, being used more extensively and for a greater number of purposes than any other. Colour - whitish or pale brown, if steamed then a reddish brown hue. Works fairly readily and gives a good finish. It can move in response to atmospheric changes so, together with its low resistance to decay, renders it unsuitable for exterior joinery. If steamed the colour changes to pink or light red. The colour varies from a light grey-brown to a chocolate brown to purplish brown, and finishes beautifully with an excellent decorative appearance due to it's outstanding grain, colour and pattern. Grain patterns vary from very plain to highly figured. The colour ranges from yellow in the sapwood, to pinkish red in the heartwood. Straight grained, it has a fine even texture, which machines and finishes extremely well. Cream to pale reddish brown in colour, it's renouned for it's strength and resistance to shock, hard Maple is straight grained with a fine texture. Colour ranges from a light yellowish brown to pale biscuit, occasionally with pinkish tinge due to soil and climate conditions. Primarily used is the Northern Red Oak - Quercus Rubra. The wood is extremely porous and therefore not suitable for tight cooperage. Colour ranges from white to pale olive brown. It is straight grained, of even texture and grain and relatively strong. Moderately light weight and low shock resistant. Colour ranges from a light yellowy brown to pale biscuit, occasionally with a pinkish tinge depending on region and site condition in Eastern USA. Straight grained with a medium to coarse texture, it machines fairly readily and stains and polishes to an excellent finish. Northern Ash, also known as 'Tough Ash' is pale cream to greyish brown in colour, generally straight grained, with a course but even texture. It is appropriate for applications where strength is a requirement. Darkbrown, almost black, sapwood yellowish white, straight grained and of rather coarse texture. Colour, vivid red toning down to dark purple-brown, this extremely stable timber has an attractive appearance together with high strength properties. A lustrous timber of outstanding appearance. Colour yellow to yellowish brown. Medium texture, slightly interlocked grain, works similar to Iroko. 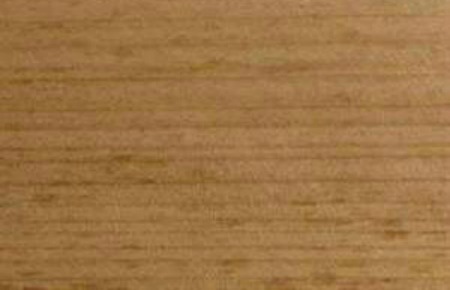 A moderately heavy timber having good dimensional stability and suitable for many of the purposes for which Oak is used. Contains a yellow dye-stuff which is liable to lech or stain under certain contitions. Colour varies from light yellow to golden brown and texture is course, often with an interlocked grain. Works moderately easily with some dulling effect on tools and so a cutting angle of 150 is recommended. This is a hardwearing timber which is resistant to decay. It has many of the desirable features of teak. Colour - nearly white to pale straw. Of fine even texture, although the grain can be interlocked, to works very easily. Colour is a dark reddish brown. Grain is interlocked or wavy with a medium to fine texture. It works fairly easily. When quater sawn it produces the familiar stripy figure. A deep rich mahogany red colour. Pronounced stripe figure, grain regularly interlocked. Sourced from Scandinavia and Russian, known also as Pine and Scot's Pine, its colour is pale yellowish-brown to red-brown heartwood with a lighter-coloured sapwood. Sourced from Scandinavia and Russia, commonly known as White Deal, Common or Norway Spruce, it's colour is white to pale yellowish brown heartwood with a nattural lustre. The timber is brown at heart, often with bright red streaks and this core is surrounded by pale-coloured sapwood. It is mostly straight grained and more uniform in texture than the softwood from North America but characteristics include red streaks. Weight for weight the timber resembles Baltic Redwood in strength properties but is marginally lower in toughness.